C & G d.o.o. 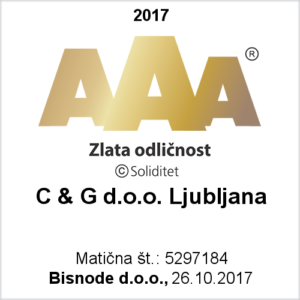 Ljubljana specializes in providing services in the field of power supply systems, energy protection and control systems, efficient energy use and ecology. The company will offer comprehensive engineering services in the area of energy supply systems, control and protections systems, efficient energy use and ecology for infrastructure projects (power supply, railroads, roads, gas networks) and utilities on domestic and certain foreign markets. Large investments planned for projects in energy engineering and ecology are a great opportunity for the company. C & G will participate in domestic and international tenders for the construction of energy facilities (i.e. hydro-electric power plants, overhead lines, transformer stations, control centres, LV and MV supply systems), where chances for winning are higher due to company references and reputation. To strengthen our business operations, the company also expanded its operations to the controlled market that is regulated with the ATEX Directive. This field includes the installation, maintenance and repair of explosion-protected (Ex) equipment. Slovenia adopted the Directive and incorporated it into its legislation with the Rules on anti-explosive protection (OJ RS, No. 102/2000) and its amendments (OJ RS, No. 91/2002 and OJ RS, No. 16/2008). In the following years, the company will become the supplier of equipment for nuclear power plants and will also obtain the necessary qualifications for supplying »safety related« equipment in accordance with the standard 10 CFR 50 App B.